South Korean President Moon Jae-in ran his presidential campaign on the platform of returning to the “Sunshine Policy.” This policy, which promoted peaceful engagement with the North, was established by South Korean President Kim Dae-jung (1997), who won the Nobel Peace Prize in 2000, and continued by his successor President Roh Moon-hyun (2003). One of the stated goals of this approach was to increase the living standards of the North Korean people to lessen the economic shock to South Korea in the eventuality of reunification. One of the legacies of this period is in altering the identity construction of the North Korean “other.” In my Master’s Thesis at the University of Chicago (2007), I explored the evolution of political rhetoric and education in the South which shifted from portraying North Koreans as the enemy to separated “brothers” under Kim Dae-jung. Although the Sunshine Policy was largely abandoned by the conservative governments that succeeded the Roh presidency, the shift in South Korean perceptions towards the people, if not the government, of North Korea continued to be solidified through education and increased contact with North Koreans. These opportunities for person-to-person engagement came through tourist excursions to Mount Kumgang and businessman to the Kaesong Industrial Complex—a North-South Korea joint industrial park—both located in the North. While the former was abandoned after the 2008 shooting of a South Korean woman, the closing of the Kaesong Industrial Complex by Moon’s predecessor, Park Geun-hye, in 2016 was unpopular with the majority of the South Korean public. As a candidate, Moon promised to reopen the Kaesong Complex. Thus, while the high-level talks at the Panmunjom truce village on the inter-Korean border may have surprised some, they were built on the foundations of these earlier periods of engagement and the election promises of then-candidate Moon. During his New Year’s press conference, Moon, perhaps wisely, acknowledged Trump’s role in restarting direct North-South Korean engagement, saying that “President Trump deserves big credit for bringing about the inter-Korean talks.” Reportedly, Trump specifically asked the South Korean president “to publicly give him the credit for creating the environment for the talks.” Unsurprisingly, Trump has also publicly touted his role, saying that, “Right now, they’re talking about Olympics. It’s a start. It’s a big start. If I weren’t involved, they wouldn’t be talking about Olympics right now. They’d be doing no talking or they would be much more serious.” But, does Trump’s hardliner policy merit credit for the positive shift in inter-Korean relations? If Trump’s foreign policy towards North Korea was limited to a tougher posture on security and sanctions, there would be a case to acknowledge a positive influence on getting the leader of North Korea, Kim Jong-un, to the negotiating table—even if those talks are limited to the Olympics and family reunions for now. To the extent that Trump’s erratic behavior concerning the North Korean nuclear crisis as well as his penchant for taunting Kim Jong-un with Twitter insults has increased the prospect of war, enhancing the need for dialogue, however, I doubt anyone in South Korea feels grateful for the increased threat from the North. To the contrary, the lack of clear signals regarding the U.S. potential for military engagement—on one day expressing Trump’s willingness to meet with the North Korean leader, on another day threatening military strikes—makes it nearly impossible for Moon to obtain any security concessions from Kim Jong-un. For show or can we expect anything to change? An important question is whether North Korea’s participation in the PyeongChang Olympics is more show than substance? The presentation of Korean unity at the Olympics definitely contains a heavy dose of political theatre, but such displays are significant in themselves. This is especially true regarding the North Korean regime, whose international isolation means that we have very little information to assess the government’s foreign policy intentions. Of particular note, this is Kim Jong-un’s first attempt at any cooperation with the South. I will not be at all surprised if Sunshine 2.0 does not follow the playbook of the previous era of bilateral engagement. Bilateral talks do not mean, however, that we should expect a significant shift in North Korea’s nuclear program. These early rays of sunshine do not fundamentally alter North Korea’s security concerns, let alone the regime’s obfuscatory domestic politics. 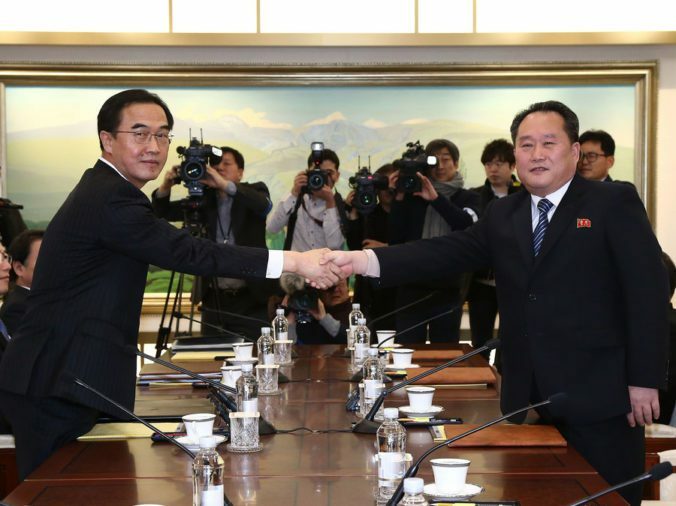 Whether inter-Korean dialogue continues beyond the Winter Olympics or substantially reduces the heightened tensions of war depends largely on how these talks influence President Trump. In exchange for publicly acknowledging Trump’s role in the Korean Olympic diplomacy, President Trump agreed to “postpone joint military drills until after the Olympics, to avoid antagonizing North Korea.” Of course, we also learned this week that Trump abandoned the nomination of Victor Cha as ambassador to South Korea, because Cha raised concerns of the utility of military strikes that would not denuclearize the Korean peninsula, but would instead result in millions of South Korean casualties. With such a capricious U.S. President, we can only hope that as long as he can take credit for their success, Trump may begin to shift to a strategy of promoting inter-Korean dialogue rather than military provocation.